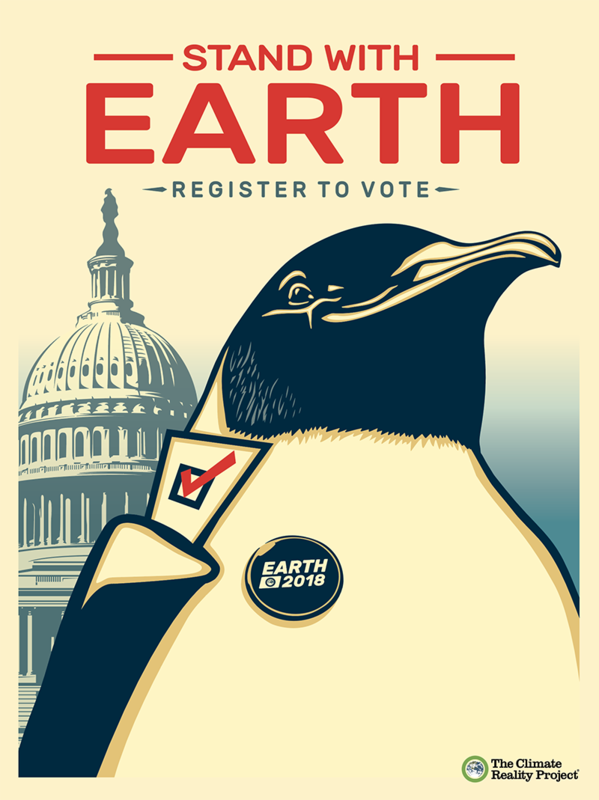 Washington D.C. (Oct. 9, 2018) – Today, Climate Reality Chairman and former US Vice President Al Gore announced his support for a new breed of politician: a Congressional candidate and emperor penguin named Earth. A strong supporter of green initiatives and a clean energy economy, Earth is urging voters to get out and vote before our planet finds itself on thin ice. The Earth for America campaign is a partnership between The Climate Reality Project, MAL\FOR GOOD, TBWA\Chiat\Day and The Mill, using youth-oriented humor and state-of-the-art animation to create Earth, the candidate who puts our planet first. Actress, Host & Digital Content Creator Liza Koshy is featured as the voice of Earth, including in the campaign’s official announcement video. Renowned artist Shepard Fairey’s Studio Number One designed Earth’s official campaign portrait in his signature style. Earth for America aims to encourage young people to register and vote this November for the future they want. While Earth herself will not be on the ballot, the important issues she stands for – such as renewable energy, clean energy jobs, fighting the climate crisis, land conservation, health, and clean air and water – will be. When young people turn out to vote, their impact can be decisive. Encouragingly for Earth, young Americans of all backgrounds and parties recognize that protecting the planet we share isn’t a partisan issue. For more information about Earth’s candidacy, please visit www.earthforamerica.com or follow her on Instagram, Facebook and Twitter @earthforamerica. TBWA is The Disruption® Company: the cultural engine for 21st-century business. One of the world's most innovative and creative companies, TBWA uses trademarked Disruption® methodologies to develop business-changing ideas for brands. A top-ten-ranked global advertising agency with 11,300 employees across 305 offices in 98 countries, TBWA includes brands such as Auditoire, Digital Arts Network (DAN), eg+ worldwide, The Integer Group®, TBWA\Media Arts Lab and TBWA\WorldHealth. Global clients include adidas, Apple, Gatorade, GoDaddy, Henkel, McDonald's, Michelin, Nissan, Pernod Ricard, Pfizer, Standard Chartered Bank, Singapore Airlines and Vichy. Mill Mascot is a product that combines real-time animation and game engine technology with motion sensors; enabling a digital puppeteer to control animated characters through hand gestures. This gives directors, creatives and clients the ability to ‘direct’ CG character performance live and make creative decisions on the fly. This is the perfect solution for quick-turnaround animated social media content, as well as live performance and episodic entertainment.